Depending on your outlook, James Franco is either a serious artist who acts like a clown to pay the bills, or a clown who thinks he's a serious artist. Honestly, my opinion wavers depending on the quality of his latest effort behind the camera, which admittedly none have been very good. But along the way I do see markers of improvement, and having just sat through Franco's adaptation of John Steinbeck's In Dubious Battle, I'd say he's never been more successful. That's all I'll say for now until the review, but you can get a look at the dustbowl drama, which coincidentally is part of Steinbeck's "Dustbowl Trilogy"(probably the least recognized of them). Franco directs, writes, produces, and stars in the labor drama set in the Depression era as California apple pickers fight for their rights to a living wage. If you guess that "The Man" fights back hard and people start dying, then you guessed right. Nat Wolff takes point on this one, joined by Selena Gomez (!!! ), Bryan Cranston, Robert Duvall, Sam Shepard, Josh Hutcherson, Ahna O'Reilly, Analeigh Tipton, Vincent D'Onofrio, Ashley Greene, Zach Braff, and Ed Harris. When Franco needs to call in favors he isn't shy about it. 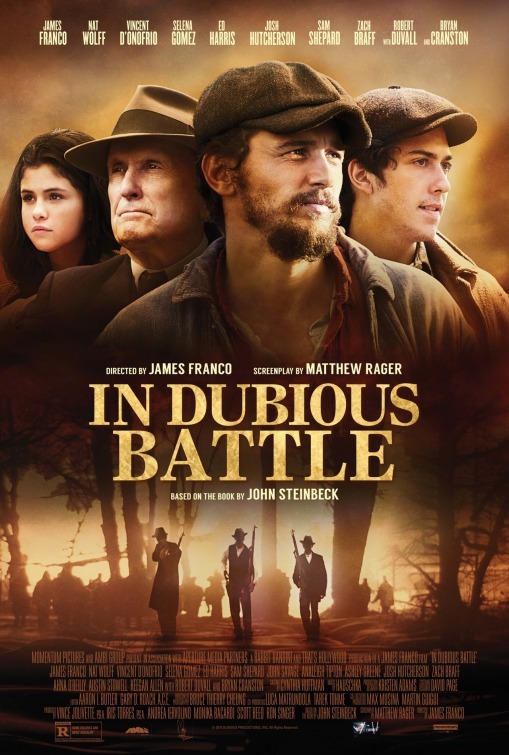 In Dubious Battle opens February 17th.